home > Survivors' Stories > Susumu Amato, and his wife Yurie "Grateful for their survival"
Each year, as August 6 approaches, Yurie Amato, 83, and her husband Susumu, 85, reaffirm the feeling: "It was a terrible experience, but we're glad we survived." They express gratitude for the lives fate has given them. Back in August of 1945, Yurie was 17, a second-year student at Hiroshima Second Municipal Girls' High School (now, Funairi High School). On August 6, the day of the atomic bombing, she was working as a mobilized student at a factory in Nishi Ward, about 1.5 kilometers from the hypocenter. Given the task of cleaning canteens, she was standing in front of a mirror, set to tie a towel around her head. At that moment she heard a loud boom and saw a flash of orange. The building shook and then collapsed. Yurie found herself under the wreckage of the building. She was able to crawl out, but discovered glass fragments stuck in her back and her face. Looking back, she recalled: "In a single moment I was changed into a young girl covered with blood and dust." Her left hand was injured, too, and she couldn't move two of her fingers. When she returned to her home in Naka Ward, she found that her house had burned to the ground. She was reunited with her anxious mother, Fusa, 63 at the time, at an evacuation site. They were unable to find her sister, Hideko, 36, who was working as a hairdresser. Hideko had run a hair salon out of her home, but the house was slated to be dismantled in order to create a fire lane in the event of air raids. Yurie later heard from an acquaintance that, on the morning of August 6, Hideko had gone to a house in the neighborhood to discuss locating a new site for her hair salon. She likely was buried underneath that fallen house. Yurie and her mother gathered up the bones that seemed to be her sister's remains, wrapping as many as they could with a white cloth. As the father had passed away some time before, Hideko's livelihood had been keeping the family afloat. "I feel sorry for my sister," Yurie said, choking back tears. "She supported our family instead of getting married, then sacrificed her life for the country." 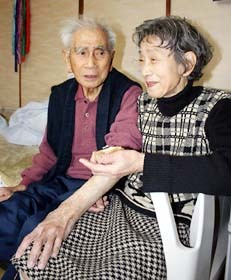 In 1953 she married Susumu, who is also an A-bomb survivor. On the day of the bombing, Susumu was 18 years old and he was working at the Toyo Kogyo factory (now, Mazda, a major automobile maker). After working the night shift, he had a day off on August 6. 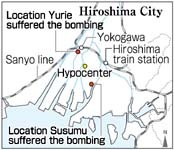 He was near the Tsurumibashi Bridge, about 1.5 kilometers from the hypocenter, when the bomb exploded. The blast blew him into the air and he landed in the river. He had severe burns on the left side of his body. No proper medicine was available, though, so he fashioned a home remedy which was rumored to be effective. He mixed bone meal, usually used as fertilizer, with oil and rubbed this concoction onto his burned skin. His body still bears keloid scars today. Susumu now feels pain in the joints of his legs and he spends most of the day in bed. "It might be hard for young people today to understand our experience," he said. "But atomic bombs and war are evil things." When Yurie said, "During the war, we didn't have anything like a 'springtime of life' in our youth," I realized how blessed we are today. The register of students who attended Hiroshima Second Municipal Girls' High School is still preserved by Funairi High School. In this register is a notation about Yurie Amato. It says: "As vice-president of the class, she showed a strong sense of responsibility. In December 1944, she received a commendation from the factory where she was working. Yurie's younger days were dominated by the war. She was mobilized to work at a military factory and students were too preoccupied with the war effort to study. Apparently, they weren't even permitted to dress up their school uniform with a ribbon when they went to school. The atomic bombing of August 6, 1945 stole away Yurie's older sister, who had been working as a hairdresser to support the family. As she shared her experience, Yurie's words left a strong impression on the two high school students who interviewed her. Staff writers of the Chugoku Shimbun are in charge of this series of articles, which will appear in every subsequent issue of Peace Seeds. We are seeking A-bomb survivors who wish to share their experiences of the bombing with children of their grandchildren窶冱 age and teenagers interested in hearing these experiences. If you would like to take part, please send a postcard with your name, address, age (grade in school), and telephone number to the Peace Seeds Editorial Department or send an email message tokidspj@chugoku-np.co.jp. Our telephone number is 082-236-2714.